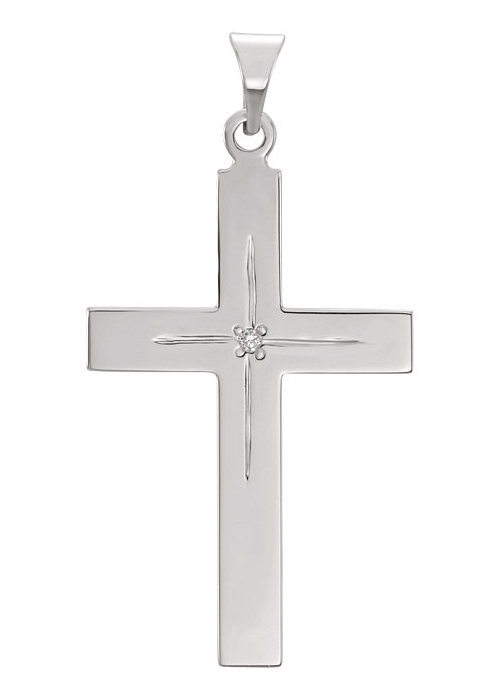 Apples of Gold Jewelry's Faith Alone diamond accent cross pendant in 14K white gold features a single diamond and a beautifully polished cross pendant that makes wearing your faith stylish and meaningful. The white gold pendant has a simple scored design leading from the arms of the cross to the center, where a single 0.01 carat diamond sits. This simple accent makes this pendant even more stunning, as the diamond is rated G-H for color and I1 for clarity. This beautiful pendant, which measures 1 inch tall by 0.70 inch wide, makes a stunning gift for women of any age! "Therefore we conclude that a man is justified by faith without the deeds of the law. "(Romans 3:28). We guarantee our Faith Alone Diamond Accent Cross Pendant, 14K White Gold to be high quality, authentic jewelry, as described above.